It is located at Kurnool district. Total area is 6.14 sq km. Open grassland interspersed with dry thorny bushes. Home for the endangered Great Indian Bustard. Other animals found are Black buck, Bonnet monkey, Wolf, Jackal, Russel’s viper and Cobra. Accommodation is available at the Kurnool Forest rest house and Nandikotkur Inspection bungalow. Best season is visit October to February. Road: 60 km by road from Kurnool railway station. 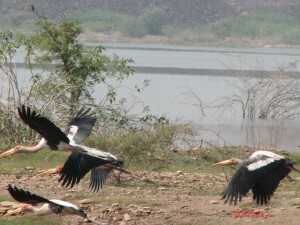 This entry was posted in Andhra Pradesh, Rollapadu Wildlife Sanctuary. Bookmark the permalink.